News | Star Shipping Inc.
TEL-AVIV, Israel – May 16, 2011 – To celebrate the launch of “Star Shipping Inc.” on the Android platform, Corbomite Games today announced that the space strategy game “Star Shipping Inc.” is also be available for free on iOS devices. 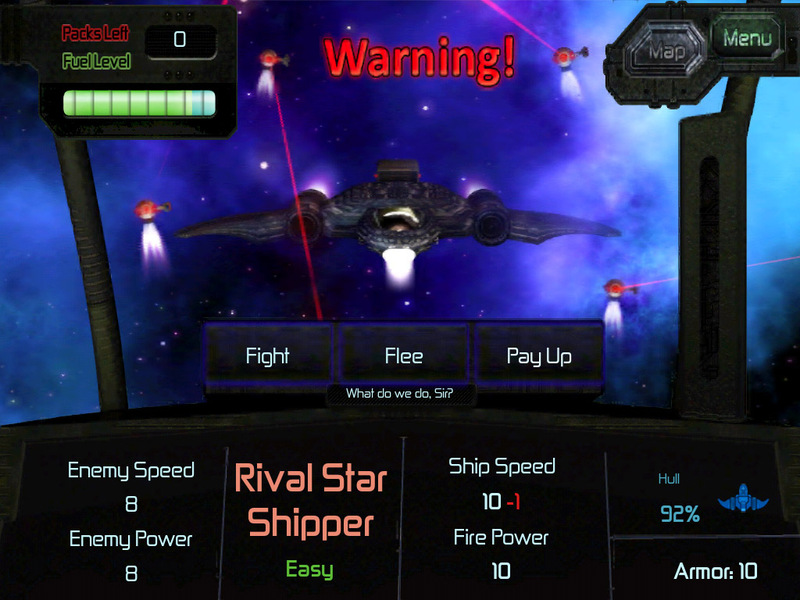 The goal of Star Shipping is to become the richest captain in the galaxy by trading commodities between new and existing planets, while working for the intergalactic space trading company “Star Shipping Inc.” Since space travel between planets is unpredictable, players encounter multiple types of enemies like space pirates, monsters and other alien life forms. You can choose between flying solo or by hiring defense drones to help protect your cargo. In-game news at the end of each turn dramatically affects the next turn’s outcome as well as random events that occur during travel which make players think twice before taking chances, while increasing the fun as the game progresses. 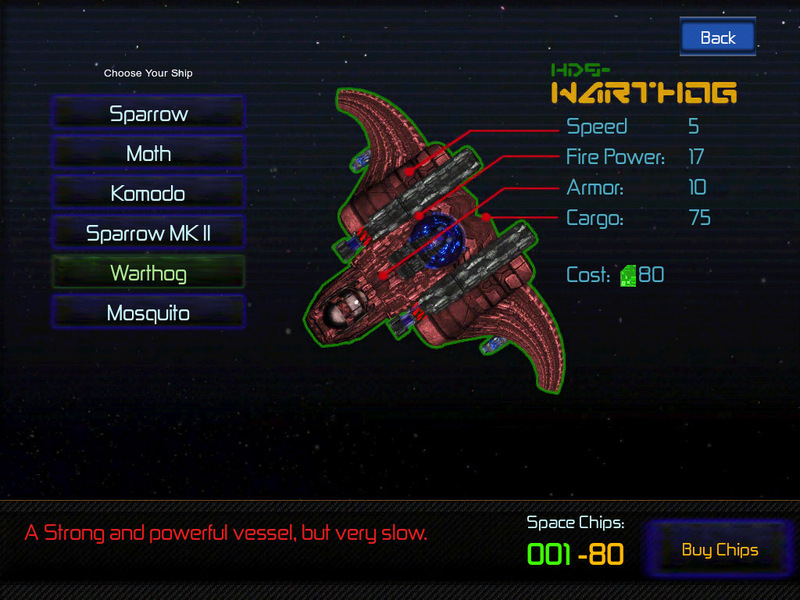 Star Shipping offers players challenges that don’t rely on their ability to hit stuff on the screen, and doesn’t require them to be completely focused on the game at all times. Instead, they can play at their own pace, and use economy planning skills and intellect to trade various commodities between stars and climb up the score ladder as they accomplish the goal of becoming the richest space captain in the galaxy. Star Shipping includes an in-game store where you can buy upgrades to your ship in order to increase performance and get higher scores, scoring and ranking systems, leaderboards, achievements, challenges and more. In the high resolution version of the game, there is significantly more content, and players will see even more beautiful space backdrops, planets, aliens, nebulae, space ships, items and characters. The game also includes unique features for each platform, for example, the accelerometer is used on the iPhone and iPad, and the mouse is used on PC and Mac. TEL-AVIV, Israel – Feb 11, 2011 – To celebrate the launch of “Star Shipping Inc.” on the newly opened Mac App Store, and an online version on Kongregate, Corbomite Games today announced that the space strategy game “Star Shipping Inc.” is available and free for the day until February 12th, 2011 @ 11AM GMT. The goal of Star Shipping is to become the richest captain in the galaxy by trading commodities between new and existing planets, while working for the intergalactic space trading company “Star Shipping Inc.” Since space is unpredictable when traveling to different planets, you’ll encounter multiple types of enemies like space pirates, monsters and other alien life-forms. You can choose between flying solo or by hiring defense drones to help protect your cargo. In-game news at the end of each turn dramatically affects the next turn’s outcome as well as random events that occur during travel which make players think twice before taking chances, while increasing the fun as the game progresses. Star Shipping offers players challenges that don’t rely on their ability to hit stuff on the screen, and doesn’t require them to be 100% focused on the game at all times. Instead, they can play at their own pace, and use economy planning skills and intellect to trade various commodities between stars and climb up the score ladder as they accomplish the goal of becoming the richest space captain in the galaxy. Star Shipping includes an in-game store where you can buy upgrades to your ship in order to increase performance and get higher scores, scoring and ranking systems, leader boards, achievements, challenges and more. 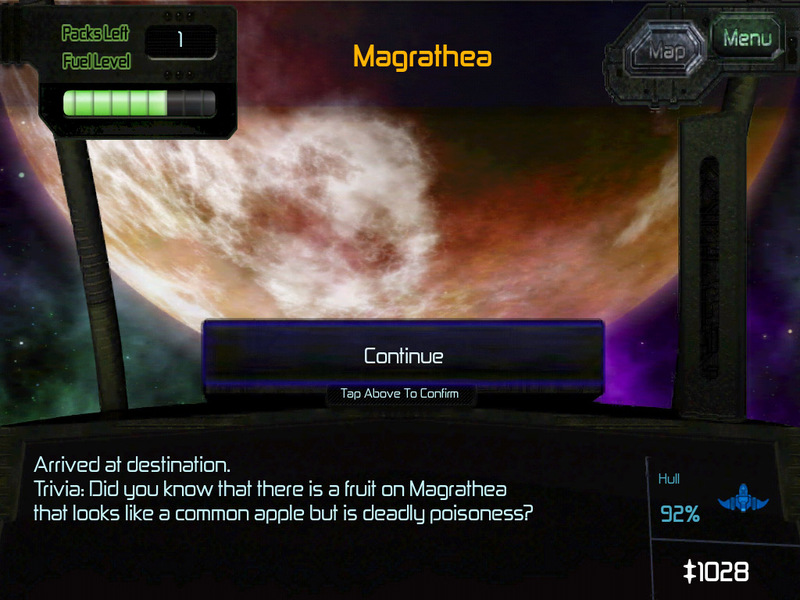 In the high resolution version of the game, there is significantly more content, and players will see an improved version of the beautiful space backdrops, planets, aliens, nebulae, space ships, items and characters. The game also includes unique features for each platform, for example, the accelerometer is used on the iPhone and iPad, and the mouse is used on PC and Mac. Founded in 2006, Corbomite Games is a game development studio focusing on episodic adventure games. Corbomite employs an ace team of industry veterans, including Israeli comics creator and celebrity Uri Fink. A team of talented writers, artists and software engineers with years of experience in computer and role playing games, rounds out the production staff. Corbomite Games currently has two episodic comedy adventure game series in production, “Pizza Morgana” and “Zbang”, an Action-adventure game called “Heavenly Hell” and recently added a third series, “Knights in Shining Armor” to its games portfolio. The studio is led by Oded Sharon, an experienced game maker with a passion for adventure games, music-based games, RPGs and MMOs. The goal of Star Shipping is to become the richest captain in the galaxy by trading commodities between new and exciting planets, while working for the intergalactic space trading company “Star Shipping Inc.” Since space is unpredictable while traveling to different planets, you’ll encounter multiple types of enemies like space pirates, monsters and other alien lifeforms. You can choose between flying solo or protecting your cargo by hiring defense drones. In-game news at the end of each turn dramatically affects the next turn’s outcome as well as random events that occur during travel will make players think twice before taking chances and increases the fun as the game progresses. Star Shipping offers players challenges that doesn’t rely on their ability to hit stuff on the screen, and doesn’t require them to be 100% focused on the game at all times. Instead they can play at their own pace, and use economy planning skills and intellect to trade various commodities between stars and climb up the score ladder as you accomplish your goal of becoming the richest space captain in the galaxy. Star Shipping includes an in-game store where you can buy upgrades to your ship in order to increase performance and get higher scores, a bank where you can keep your savings and where you can loan cash in times of need, scoring and ranking systems, leader boards, achievements, and challenges. In the high resolution version of the game there is significantly more content, and players will see an improved version of the beautiful space backdrops, planets, aliens, nebulae, space ships, items and characters. The game also includes unique features for each platform, for example, the accelerometer is used on the iPhone and iPad, and the mouse is used on PC and Mac. “Star Shipping Inc.”, is now available on Apple’s app store. A new commerce strategy game will take you on to the stars. Tel-Aviv, Israel – Sept 5th 2010 –Corbomite Games today announce the release of a new commerce strategy game “Star Shipping Inc.” The game is now available in the Apple for iPhone, iPad, and iPod touch devices. Your goal in Star Shipping Inc. is to become the richest captain in the galaxy by trading commodities between new and exciting planets, while working for the intergalactic space trading company “Star Shipping Inc.”. Since space is unpredictable while you travel to the diffrerent planets, you’ll encounter multiple type of enemies like space pirates, monsters and others. You can choose between flying solo or protect your cargo by hiring defense drones. In-game news at the end of each turn dramatically effect the next turn’s outcome as well as a dozen of random events that can occur during travel will make you think twice before take chances and increases the fun experience with a high replay value.. The game includes more features like, an in game store where you can buy upgrades to your ship in order to increase performance and get a higher score, a bank where you can keep your savings and where you can loan cash in times of need, scoring and ranking systems, leader boards, achievements, and challenges. Star shipping and will have both a standard version for the iPhone and iPad and an additional high resolution HD version available later for iPhone 4 and the iPad. In the high resolution version of the game you’ll see an improved version of the beautiful space backdrops, planets, aliens, nebulae, space ships, items, and characters. The game will also include unique features for each platform, for example, a use of the device’s accelerometer. Corbomite Games currently has two episodic comedy adventure game series in production, “Pizza Morgana” and “Zbang”, an Action-adventure game called “Heavenly Hell” and recently adding a third series “Knights in Shining Armor” into its games portfolio. The studio is led by Oded Sharon, an experienced game maker with a passion for adventure games, Music based games, RPGs and MMOs. A new commerce strategy game that will take you on to the stars. Tel-Aviv, Israel – August 10th 2010 – Corbomite Games today announce the development of a new commerce strategy game “Star Shipping Inc.” The game is expected to be available in September 2010 for iPhone, iPad, PC and Mac. In Star shipping Inc. you take the role of the captain of of a cargo ship traveling between star systems to trade goods and commodities in strive to become the richest star ship captain in the galaxy. Travel to new and exciting planets, encounter multiple type of enemies like space pirates, monsters and others, fly solo or protect your cargo by hiring defense drones. Receive groundbreaking and exciting news at the end of each turn that dramatically effect the next turn’s outcome. A dozen of random events that can occur during travel will make you think twice before take chances and increases the fun experience with a high replay value. “I’ve wanted to do an iPhone game ever since I first laid my hands on this wonderful device” said Oded Sharon, CEO of Corbomite Games “and especially now with the iPad and the new iPhone 4, it seems like a much more exciting time for independent game developers to reach out to new audiences which we haven’t had access to only a couple of few years ago. Now, we are able to produce high quality products, featuring high production values with stunning graphics and original musical soundtrack that are available in the palm of your hand”. Star shipping features high resolution beautiful space backdrops, planets, aliens, nebulae, space ships, items, and characters. The game includes an in game store where you can buy upgrades to your ship in order to increase performance and get a higher score. For example, you can buy upgrades to get more speed, strength, or resilience. The game also features a bank where you can keep your savings and where you can loan cash in times of need. Star shipping and will have both a standard version and an HD version available for iPhone and iPad. The game will also include unique features for each platform , for example, a use of the iPhone’s accelerometer.